This stretch of street leads into a small parking lot in the front of a small shop. 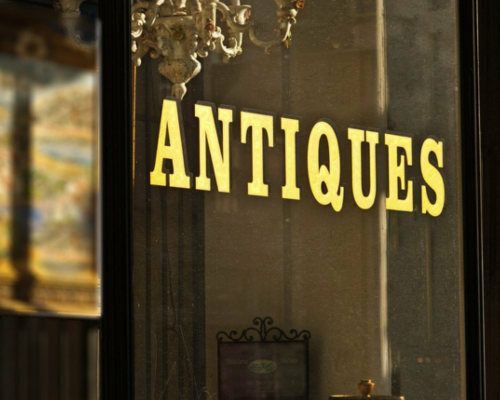 A large sign bearing the word Antiques is hung in the window in the shop's front hinting at what is on offer there. The glass door leading inside holds a sign that can be turned to show when the shop is open for business or closed. The street is well lit by the street lamps that are hung with baskets of flowers and seasonal banners that all have Mythic Wood and Cedar Street on them in this area going down the road. 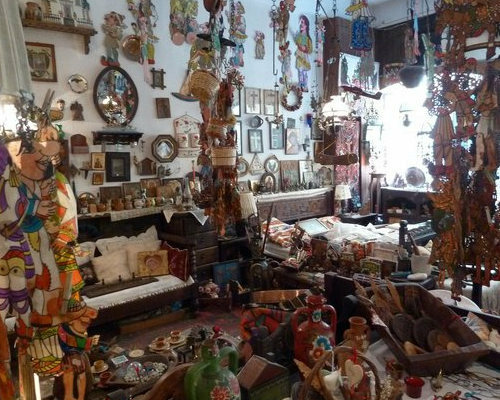 The inside of this shop is quite cluttered. Dark wood floors and paneled wood walls painted a dark green give the place an even less open feel. Collections of random knick-knacks line the shelves. Some of the larger items are placed on tables and even on the floor between those shelves, making traversing the shop a bit precarious if one is not careful. Both junk and treasures can be found here as well as everything in between. A counter and old fashioned cash register are placed near the middle of the shop and owner of the business as well as the employees are quick to enforce the: you break it, you buy it policy.